The 18″ Wisteria is instantly recognizable as the signature Tiffany Studios lamp design. With close to 2000 individual pieces of glass that cascade from the cast bronze crown at the top and end with an irregular lower edge, the shade is a masterpiece of lighting design. We have been commissioned to create a pair of matching 18″ Wisteria lamps, and they have been taking most of our time this summer. Each shade will take approximately 300 hours to complete. At the top o the post, the first shade is shown laid out on the light table ready for foiling. Irwin is seen foiling the shade in the second photo. 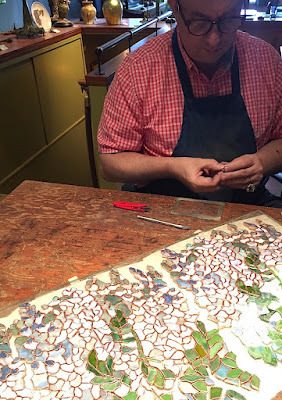 Because of the large number of pieces, every step takes multiple days to complete. Once every piece of glass has been foiled, they are individually transferred onto of form in preparation for soldering. The form is coated with our house-made wax that is tacky enough to hold every piece in place. The bronze crown can be seen at the top, and the gaps in the glass will be filled in with cast metal branches that extend down into the design. We will show more images from this time consuming project in future posts.